KYIV, Ukraine—Ukraine has gone to war against Russian propaganda. Last week, Ukrainian President Petro Poroshenko announced the deployment of Ukrainian electronic warfare units to jam the transmission of about 40 Russian and pro-Russian television channels in the country’s embattled eastern Donbas region. “We will protect Ukrainians from the information poison coming from the Russian Federation,” Poroshenko said at a meeting with security officials in April, Ukrainian agencies reported. Kyiv said the operation would protect 150 settlements along the eastern front lines from Russian propaganda. Many Ukrainian war veterans, as well as government officials and military commanders, say there is no military solution to the 4-year-old conflict in eastern Ukraine. For that reason, the information battle against Russian propaganda is a key piece of Ukraine’s overall mission to regain control and influence over the two breakaway territories in eastern Ukraine that have been de facto Russian puppet states since April 2014. “The importance of winning hearts and minds of our citizens in Donbas is a decisive factor for our victory,” said Serhiy Doma, a Ukrainian military veteran of the war in the Donbas who is now senior military adviser in Ukraine for the Center for Civilians in Conflict, a nonprofit, Washington-based humanitarian organization. 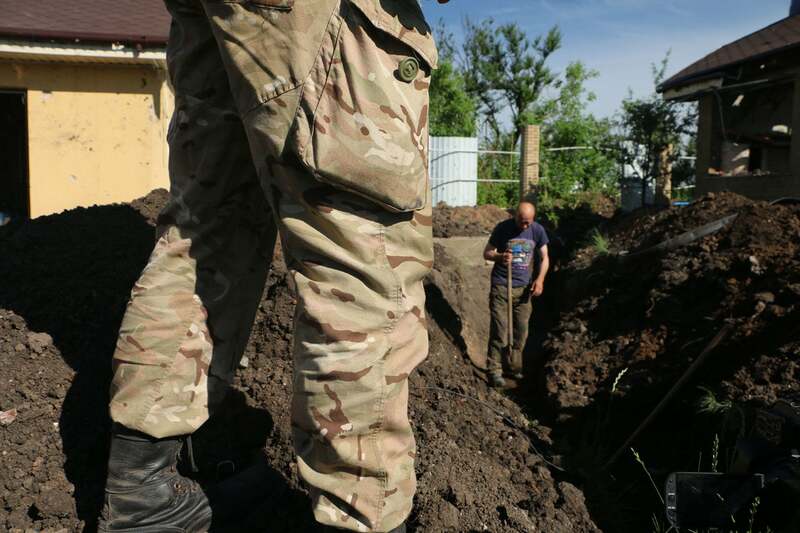 Ukrainian soldiers prepare a front-line trench. After four years of daily combat, the war in eastern Ukraine is not over. The jamming operation now underway in the Donbas comprises a gamut of Ukrainian agencies and government bodies, including Ukraine’s National Security and Defense Council, and the Security Service of Ukraine. “I am convinced that today is a significant milestone, a significant progress in protecting Ukraine from the factors of Russian hybrid aggression,” Poroshenko said. Poroshenko also directed national security officials to explore the possibility of similar jamming operations in the border regions near Russian-occupied Crimea in the south, as well as in the west near the border with Russia’s proxy territory of Transnistria in Moldova. For its part, Moscow has maintained an aggressive electronic warfare footprint in eastern Ukraine, jamming Ukrainian military communications, as well as civilian TV and radio broadcasts, and cellular networks. Ukrainian troops deployed to the war zone tell The Daily Signal that Russian electronic warfare units frequently jam Ukrainian drones—including the American-made RQ-11 Raven hand-launched, unmanned aerial vehicle, which Ukrainian forces operate in combat. In the opening weeks of the war in eastern Ukraine—which began four years ago this April—combined Russian-separatist forces prioritized the destruction of Ukrainian broadcast TV and radio antennas, and took control of the cellular networks. 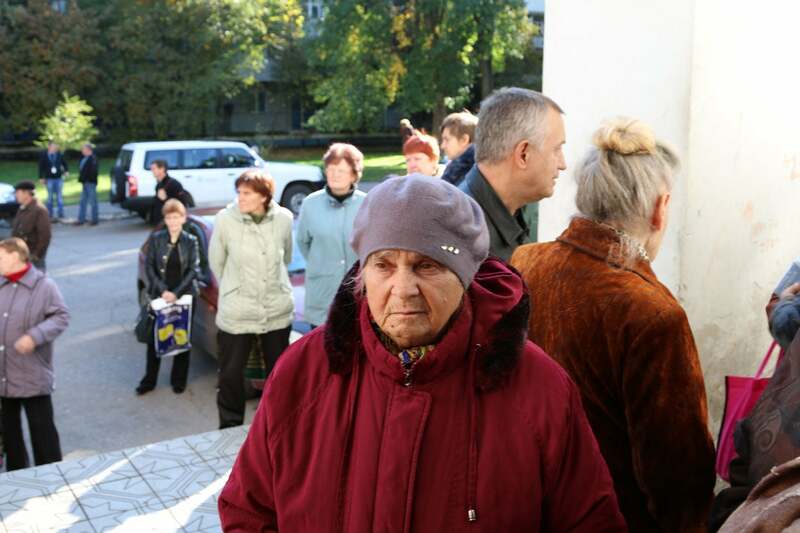 Ukrainians displaced by the conflict in the Donbas line up to receive United Nations food aid in 2016. From the war’s outset, control over the information space was as much of a priority as taking physical terrain with conventional military force. the U.S. Army’s Asymmetric Warfare Group said in its 2017 “Russian New Generation Warfare Handbook”—a study of Russian hybrid warfare operations against Ukraine. 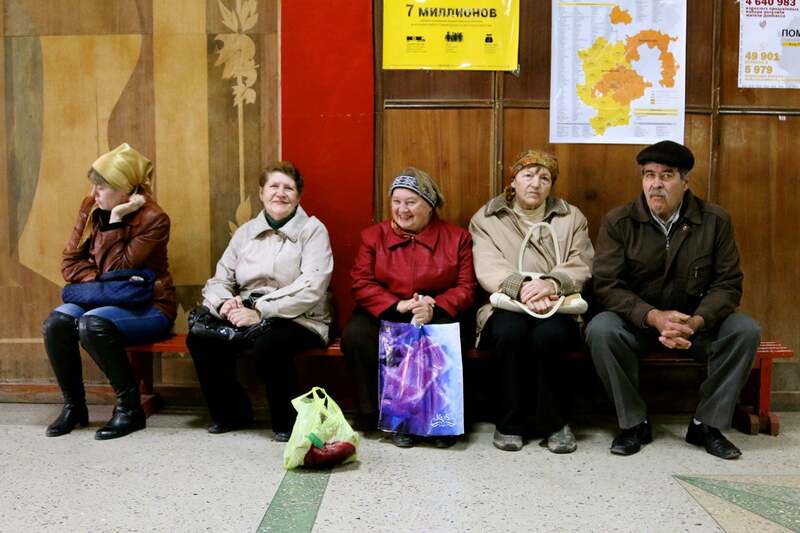 For years, Ukraine’s eastern Donbas region has been under the shadow of Russian propaganda. 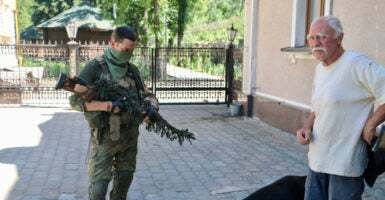 Civilians living in the war zone, as well as Ukrainian soldiers deployed to the front lines, could watch only Russian broadcast TV channels, as well as broadcasts from Russia’s proxy separatist forces. Cable television was typically cost prohibitive for both civilians and soldiers. “To date, this poison comes from the occupied territory, from the east of our country to ensure the distribution of Russian propaganda to citizens of Ukraine living near the contact line,” Poroshenko reportedly told security officials in April. Last year, Ukraine rebuilt many of its TV and radio transmission towers in the war zone and resumed the broadcast of Ukrainian TV and radio channels. 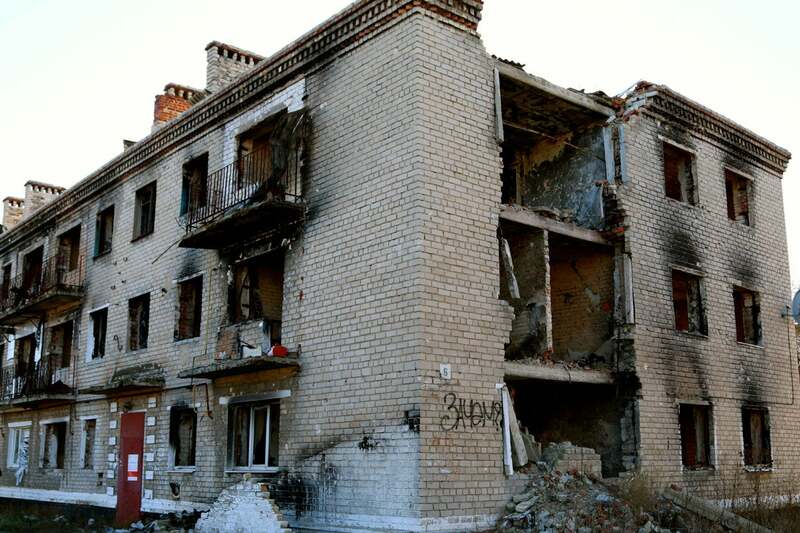 War damage in the front-line town of Marinka in eastern Ukraine. Television is the most widespread means of media consumption among Ukrainians when it comes to national news—especially among Ukrainians older than 45, says a 2017 report on media consumption in Ukraine conducted by InMind, a Ukrainian market research consultancy, with financial support from the U.S. Agency for International Development. The InMind report said Ukrainians are overwhelmingly distrustful of Russian media. Yet, there was no alternative to Russian outlets for years in the war zone, allowing Russia’s media narrative to take root there. “The vast majority of those who trust Russian media live in the East,” the InMind report said. Thus, Ukrainian officials are now devoting more resources and funds to the fight Russian disinformation in the war zone. A key part of that effort is providing citizens in eastern Ukraine access to media resources that provide a pro-Ukrainian media narrative. In December, the National Council of Ukraine on Television and Radio Broadcasting approved the licensing of a pro-Ukrainian TV channel in the eastern war zone called Donetchyna-TV. In August 2017, the council issued licenses for several new radio stations to broadcast in the conflict area. “It is about conveying a signal of Ukrainian media that can be considered today as a vaccination against Russian propaganda,” Poroshenko said of Ukraine’s electronic warfare operation to disrupt Russian propaganda. Four years after the war began in April 2014, Ukrainian troops remain hunkered down in trenches and improvised forts along a 450-kilometer-long front line in the country’s embattled Donbas region. There, Ukraine’s military continues to fight a grinding, static war against a combined force of pro-Russian separatists, foreign mercenaries, and Russian regulars. It’s a long-range battle, in which soldiers hardly ever see at whom they’re shooting. At some places, no man’s land can be several kilometers wide. At others, the two sides are close enough to shout insults at each other. The operative cease-fire, known as Minsk II, was dead on arrival—although the war remains moderated in intensity and is geographically frozen, according to the cease-fire’s rules. But the war never ended. Today, one Ukrainian soldier still dies in combat every three days. 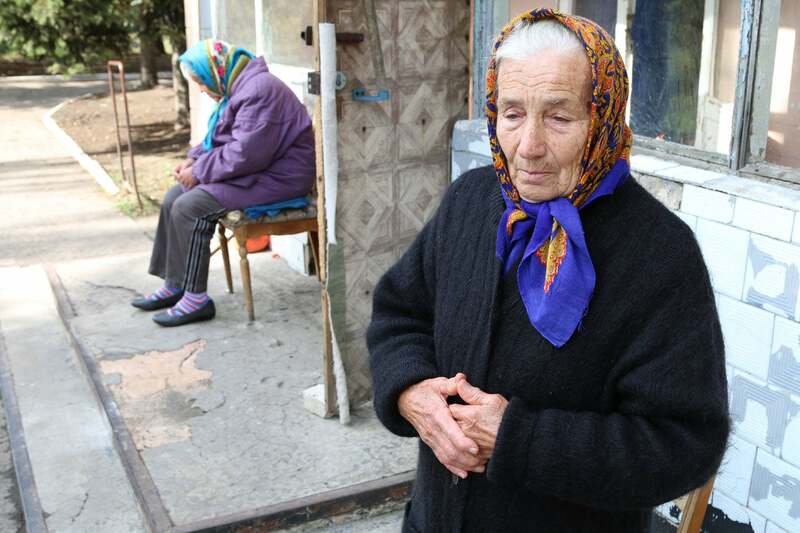 The war has displaced about 1.7 million Ukrainians. And civilians frequently die, too. Sometimes they’re caught in the crossfire of the artillery or the snipers. Most often these days, however, it’s due to land mines. On April 7, a family of four died when their car drove over a land mine while crossing the front lines near the city of Luhansk, a stronghold for Russia’s proxy separatist forces. The physical consequences of the shooting war are generally confined along the front lines in the Donbas. Yet, there’s another war going on in Ukraine, which knows no boundary. Russian cyberattacks have hit Ukraine’s power grids, water supply systems, banking systems, largest airport, and electoral process. To counter this threat, since 2014, Ukraine has established a Situation Center for Cybersecurity, and the government has fostered closer ties to Western intelligence agencies to bolster its cyberdefenses. Russia has also exploited social media as a weapon of war against Ukraine. Last May, Ukraine consequently banned Russian internet search engines and Russian social media sites. Millions of Ukrainians used those Russian websites, and the move was not popular. But Ukrainian security officials determined the sites posed a national security threat, and the ban stuck. 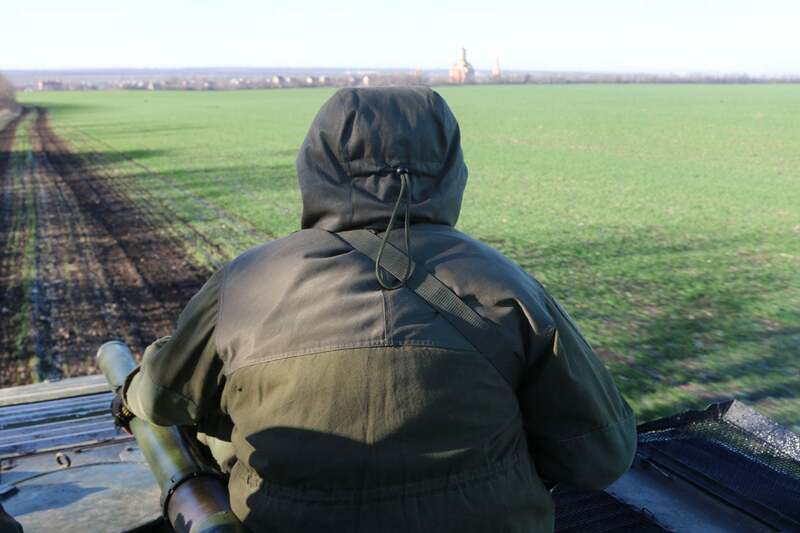 A Ukrainian armored personnel carrier traverses no man’s land at a location near the front-line town of Marinka. About 77 percent of Ukrainians use the internet daily, and 90 percent of Ukrainians use the internet as a source for national news, according to InMind’s 2017 media consumption report. Russia’s weaponization of broadcast media has spurred Kyiv to enact countrywide, defensive measures, including bans on Russian TV stations from broadcasting in Ukrainian territory, and the expulsion of foreign journalists accused of spreading Russian propaganda. Russian information warfare is now a global threat, many experts say. 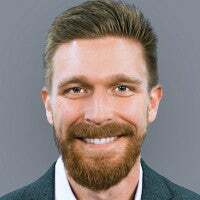 For that reason, some see Ukraine’s myriad defenses against Russian information warfare and cyberattacks as bellwethers for the kinds of free-speech trade-offs that U.S. and European countries will face when defending against Russian hybrid aggression. “Russia will continue its attempts to influence democratic decision-making processes in the West, especially in EU countries that have elections in 2018,” said an unclassified 2018 report on Russian activities by the Estonian Foreign Intelligence Service. “The Kremlin believes that creating confusion in Western countries gives Russia greater freedom of action and increases its influence,” the Estonian report said.